Did you check out the "Rich Kids of Instagram" Tumblr last year? I did peruse it briefly, but the human mind can only endure so many toy dogs riding in Maybachs before my gorge rises beyond the point where normal peristaltic function can suppress it. On the other hand, E! -- secure in the wisdom earned by decades of programs like Bridalplasty and Living Lohan -- decided to create a "hip" and "with it" TV show based around the "groovy" concept of social media. Thus, #RichKids of Beverly Hills, the show that forces us to ask the question: was the neutron bomb really *that* bad an idea? Starting out, I was naturally curious to find out what the parents of these dissolute brats do for a living, mostly because I'd like to know what field of work I should have gone into. Conversely, I'm not paid enough for this to do actual "research," so I have no idea how the parents of nominal main character Morgan Stewart earned their Scrooge McDuck style stacks. About all I know is she's no relation to this Morgan Stewart and wants a nose job. Dorothy Wang's dad, on the other hand, is a Chinese department store magnate/industrialist who's routinely listed among the wealthiest people alive. 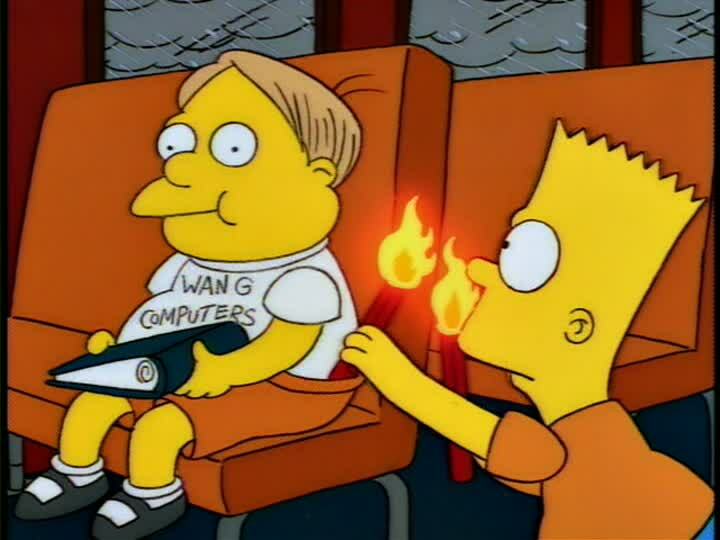 Dorothy is predictably horrible, though I couldn't help thinking how much more endearing she would've been had she worn a "Wang Computers" shirt a la Martin Prince. Roxy Sowlaty's parentage is similarly murky. One of the Episodes I Watched dealt with her dealing with being cut off from her parents. Well, "cut off" in the sense Mom and Dad will continue to pay her room and board, and give her a "little bit" of spending money, and pay off her car ("But I can't get a new one!"). That's some Dickensian level abuse, right there. At first, I though E! might need to check the sell-by date on some of these kids. Morgan's boyfriend Brendan Fitzgerald is definitely feeling the sting of male pattern baldness, but is reportedly only 25, like most of the others. He also looks like Coldplay's Chris Martin, though his miserable countenance might be attributable to anyone hooked up with a high maintenance blonde. And yes, I said "episodes" I watched. The first followed Brendan and Morgan to Cabo for their one-year anniversary. Their one year "dating" anniversary. It was a two-parter, however, and I wanted to watch the follow-up and see if my prayers were answered and the whole lot swept up by cartel enforcers, their bodies deposited along Federal Highway 1. Alas; the other ep mostly involved Wang throwing herself a birthday party, I think, and taking selfies. So many selfies. In a sad attempt to keep abreast of online trends, E! peppers each episode with Instagram shots of the cast, and advances the narrative by using hashtag terms like #readyforcabo and #1stclassisnotenough. My Twitter suggestions of #offthepigs and #eattherich were curiously ignored. Since there'd be nothing for us lowly 99 percenters to chew on otherwise, Morgan and Brenda bring their friends along on the Gulfstream to Baja. This includes somebody called Jonny Drubel and L.A. Lakers legend Magic Johnson's son, E.J., whom E! undoubtedly snapped up because he allows them, in one fell swoop, to counter claims the show doesn't depict blacks/homosexuals/overweight people.. The Mexico trip offers the nuggets you'd expect from people with the moral compass of a Gila monster: for example, Montezuma's revenge is "totally worth it after," says Morgan (just wait, "Poop Yourself Thin" will be atop the New York Times bestseller list by year's end). Meanwhile, Brendan is totally getting some action because he bought Morgan the green, $2,500 Givenchy handbag she was pining for. As a big Tarantino fan, I was really hoping for a third act scene where her head was found inside it. I wanted to give these folks some benefit of the doubt, because I'm an idiot, but they are all - shockingly - terrible human beings. My favorite part was when Dorothy and Morgan spend some time making fun of "groupers," those bottom dwelling hangers-on who tag along to bask in their presence and -- presumably -- troll for castoffs. That two women without a single marketable job skill (Morgan is a blogger, my condolences) can -- with a straight face -- criticize people for coasting on the largesse of others is cognitive dissonance of a magnitude I haven't seen since George W. Bush said, "Mission accomplished."